"Thanks to the sweet, starchy crunch of the raw corn, the combination of tastes and textures in this salad is outstanding." Whisk barbeque sauce, rice vinegar, and oil in a large bowl until smooth. Stir in corn kernels, red bell pepper, green onions, and white beans to coat. Cover and refrigerate for at least 2 hours. 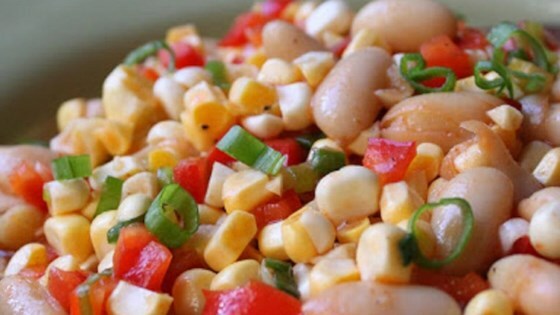 See how to make Chef John’s favorite fresh sweet corn salad. I prepared this for 50 guests this evening and it was a huge hit. No left overs. I'll be making this again. This is an ideal lodge salad. This is SO easy and good. I used olive oil instead of veg. oil and Sweet Baby Ray's bbq sauce. Family loved it. Completely simple and fast to make, yet very tasty and pretty. A definite go to salad for summer menus and with BBQ.